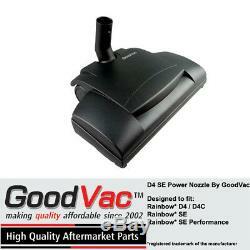 D4 - SE Rainbow Non-OEM Power Nozzle by GoodVac. 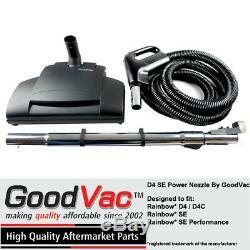 D4 SE Power Nozzle Kit by GoodVac This is a high quality durable GoodVac Brand power nozzle with electric hose and telescoping wand. 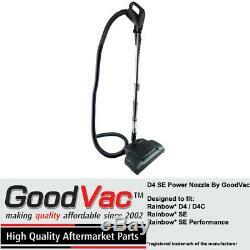 Designed to fit Rainbow Vacuums: Rainbow D3 (2 prong receptacle version) Rainbow D4 Rainbow D4C Rainbow SE Rainbow SE Performance (SEPE) The GoodVac D4 / SE Power Nozzle is made from durable and lightweight ABS plastic, light weight means easier to vacuum with and move around. Easy steering and maneuvering while cleaning with a swivel neck, soft bumpers protect your baseboards and furniture for scuffs and marks from vacuuming. 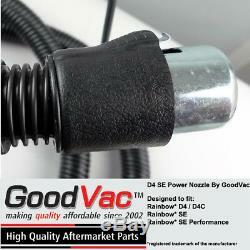 Power cord designed to fit your D4 Series Rainbow perfectly. Auto-stop feature that stops the power nozzle when something gets jammed in the brush roller, saving the motor and nozzle from damage. Special V shaped bristle path means the brush roller is always in contact with the surface and efficiently sending dirt and debris into your vacuum. Telescoping wand extends from 25" up to 39" to adjust to the perfect height for cleaning. 7' Electric hose with 22 cord and on/off switch. Features: - Telescoping Wand extends from 25" up to 39" - 7 ft Electric Hose w/ On/Off switch - 13 Cleaning Path Power Nozzle - Cogged Long Life Belt - Lightweight Durable ABS Plastic - Auto-stop feature if jammed - V Shaped Brush Bristles - Dual swivel Neck - Soft Rubber Bumper Guard - Soft Rubber Wheels. Belts, lightbulbs, brushrolls or damage due to use and or abuse of the item. Each aditional item Ships at NO CHARGE! Covers defects in parts and workmanship. Does not cover physical damage (bent pipes, cut cord or hose, cracked nozzle cover or housing). Does not cover brush roller and light bulb (if equipped). Missing parts or components - please check packaging material again. Item must be unused and with all original packaging and/or tags it came with. 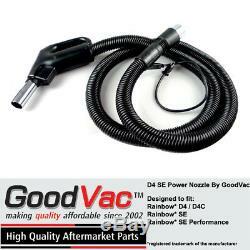 The item "Rainbow D4 SE SE Performance Non-OEM Power Nozzle with Wand and Hose by GoodVac" is in sale since Thursday, March 1, 2018. This item is in the category "Home & Garden\Household Supplies & Cleaning\Vacuum Parts & Accessories". The seller is "ez4every1" and is located in Palos Park, Illinois.